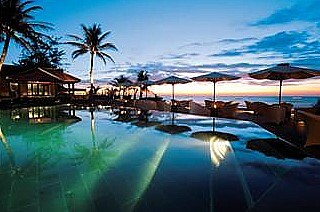 Anantara Mui Ne Resort & Spa on the South China Sea is Anantara's first resort in Vietnam. Anantara’s first property in Vietnam , the newly transformed Anantara Mui Ne Resort & Spa features 89 luxurious rooms, suites, and villas, five restaurants and bars, and fully-equipped fitness facilities. Located 120 miles from Ho Chi Minh City on the Southeast corner of Vietnam on the South China Sea, the resort offers a secluded escape in this coastal fishing village with a tropical landscape. The hotel’s design reflects its time and place in traditional Vietnamese style. Spectacular views of lush gardens, the infinity-edged swimming pool, freshwater lagoon, and the sea make this resort exceptionally peaceful and picturesque. Known for its experiential approach to hospitality, Anantara offers guests opportunities to delve into the local culture both at the property and on excursions. Vietnamese culture is threaded throughout, from the locally-grown dragon fruit incorporated into spa treatments at the Anantara Spa to guests picking fresh vanilla from a local plantation to use in the resort’s cooking classes. Anantara’s signature private “Dining By Design” concept includes dinner for two prepared by a private chef on a traditional Thung fishing boat. During the day, guests can bask on pristine beaches lined with towering, desert-like sand dunes or venture out for a morning snorkel or sail. Golf lovers can practice their swings at the exclusive nearby Sea Links Golf and Country Club or at the Ocean Dunes Golf Club, named one of the “Best 500 Golf Holes in the World” by Golf Magazine. The resort’s various dining options offer authentic Vietnamese cuisine as well as international favorites. Highlights include fresh seafood specialties, signature cocktails in locally-crafted Cham pottery mugs, and cool refreshments at the swim-up bar. At night, the bar evolves into a poolside torch-lit terrace complete with live entertainment. The chic Wine Room offers a degustation menu with fine wines expertly paired with specialty cheeses and charcuteries. Anantara is offering a special Mui Ne Discovery Package that provides a 20% discount on accommodation in either a Deluxe Room or Pool Villa. Rates begin at $184 for a single and $159 for a double, before taxes and service charges, and include daily buffet breakfast for two, complimentary in-room cable Internet access and public area WiFi, and a half-day tour of Mui Ne. A minimum two-night stay is required (three-night stay in March and April). All rates are subject to 5% service charge and applicable 10% government tax. Offer valid through December 25, 2012.